We packed our bikes and gear ready for the flight eastwards. I had the bright idea of taking our food bag as hand luggage, thereby saving $25 in baggage fees. Moments before checking our bags through I remembered there was a bottle of olive oil in the food bag which we transferred into cargo luggage. But as our carry-on went through the conveyor a small commotion developed and we were quickly whisked aside. The officer proceeded to empty the food bag, pulling out one by one a gas lighter, camp suds, cutlery knives and finally our large kitchen knife. Oops. These were sacrificed on the alter of national security and I was glowered at by the security officer and Grieg alike. We stepped out of JFK and unbeknown to us, into the ride of a lifetime. The taxi driver flinched briefly at our load, then piled it into his cab before launching us toward neon Manhattan. I was squished in amongst bikes and bags with a perfect view of the speedo…75 miles per hr was his preferred speed. The horn and indicator were entirely supefluous, though all about us they blared and flashed. At one point Grieg asked him how long he’d been driving a taxi. ‘Six years’, he replied succinctly, never taking his eyes from the road. Surely he’d just watched ‘the untouchables’. The $58 experience left us stunned but alive, which we certainly wouldn’t have been if we’d tried to ride our bikes …that would have been the road version of the going through the Athabasca Falls. He screeched to a halt outside our hotel, unloaded and tore off into the night. Right there on the street, we burst into laughter at the surreal experienced, jubilant and relieved, like the first time on a wild roller coaster ride. The hotel turned out to be excellent, they cheerfully stored our bikes and gear before we struck out looking for dinner. We didn’t go far…right across the road was this great little restaurant. After dinner we walked several blocks until gentle rain reminded us that it was nearly midnight. Early next morning we hit the streets of New York City with miles and miles of walking ahead of us. Fantastic markets, so many different types of tomatoes. Chinatown. I didn’t take photos of the buckets of live frogs and turtles wallowing in misery. Great little spot for lunch. Grieg had to show I’d to buy a beer. The museum of modern art (MoMA) opens it’s doors for free admission to the public on Friday afternoons, and since it was Friday we decided to take advantage of this. We arrived in anticipation of being suitably refined and educated by the experience only to discover a MASSIVE queue. The deal is that you have to queue for a ticket to get in for free. And that’s not all, once you have your free ticket, someone will arbitrarily decide whether your bag is more than 38×43 centimetres and therefore too big to be taken into the museum. Our bag certainly wasn’t, but this ‘someone’ was a towering creature with bloodhound eyes that terminated ideas of debate. He rumbled,’it’s too big’ thereby sentencing us to another sodding queue to remove the threat of our little pink backpack. Almost two hours after arriving, cynicism had replaced anticipation and by the time we actually saw some modern art, we weren’t interested in being refined. Moral of the story…there’s no such thing as a free lunch! NYC is full of iconic sights with no need for waiting. We continued exploring this amazing city until we could walk no more and after being fed and entertained by the feisty little matriarch of a restaurant in Chinatown who shrieked out directives to staff and patrons alike, we arrived home at 11.30pm. Time for a few brief hours sleep before striking out a couple of blocks away to The Australian Pub to watch the All Blacks take on Australia (rugby). A small but enthusiastic crowd of mostly Aussies weren’t deterred by the 3.30am kickoff, but by half time it was obvious that no amount of beer or shouting would get Australia over the line, and the Wallaby supporters slunk away leaving a dozen or so of us to cheer the All Blacks home. Back at the hotel, we decided that biking would be a much more efficient way of getting around the city so we pulled them out of their boxes and set them up for work. Armed with an excellent map app for cycling in NYC we rode through Central Park. From here our confidence grew and we spent a magical day riding all over the island. Red lights mean stop..or if you can make it, go. One way streets mean go with the flow of the traffic… or if you want to go the other way, do it. Footpaths are for pedestrians.. or if you want to bike on it, fine. If you see the NYPD whilst committing infringements, don’t worry – they won’t. When in doubt, accelerate or stop, nothing in between. And easiest of all, have a fantastic time! 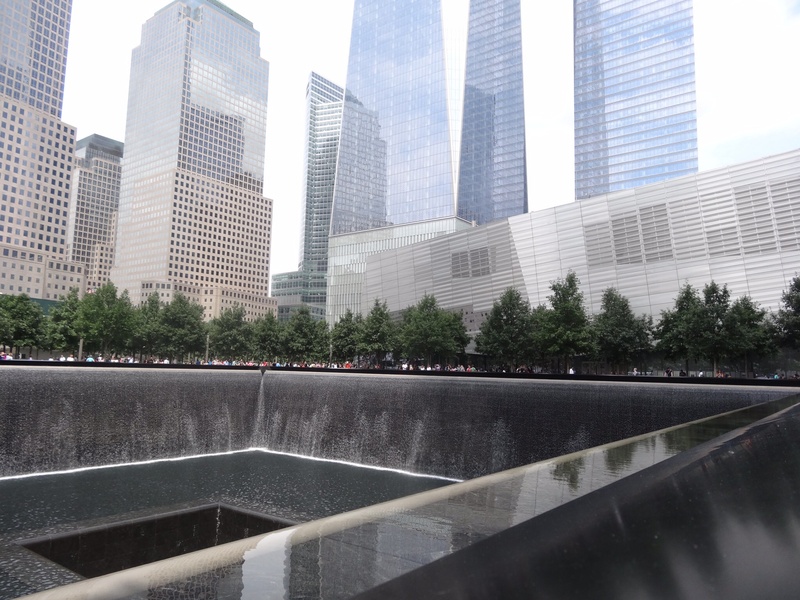 Visiting ground zero is a sobering experience. Many years ago on a family trip to the USA, we stood at the top of one of the towers. The memorial that replaces them is honouring and thoughtful in its design. We departed NYC on Sunday and rode out through Flushing Meadows which was abuzz with colour and activity since the US Open started next morning. The further along Long Island we travelled, the less American and more English it became. We reached the end of Long Island after a couple of reasonably big days. 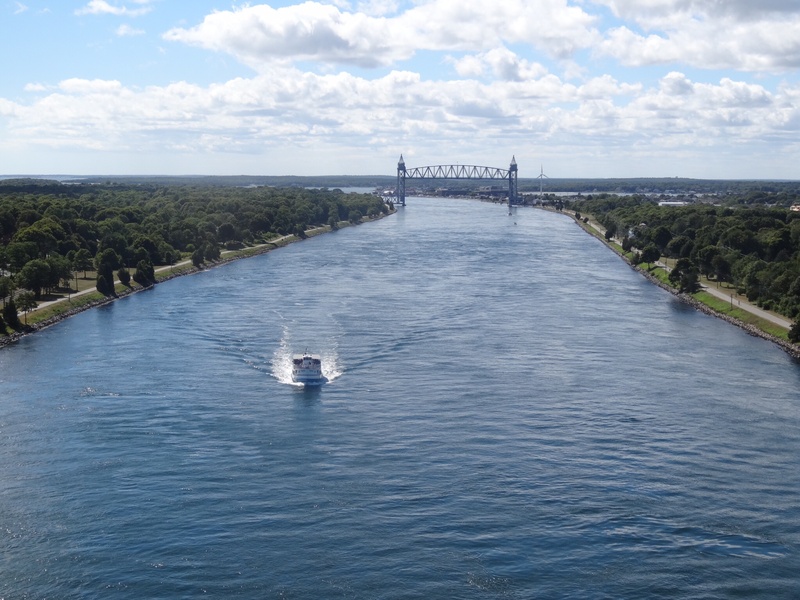 There’s a frustrating lack of signage in these parts and no confirmation that all our turns were ok until a sign appeared ‘2000 feet road ends.’ Relieved and tired we jumped on the Orient Point ferry which took us to New London, an illegitimate 4th cousin to the real London. There were no campgrounds, the tourist info centre was closed down and we were happy to leave next day. This part of our adventure is not well researched and there’s a lot of thinking on the run. But we were cycling through lovely rolling countryside with huge old oaks and maples, and eventually we arrived in Quonset. 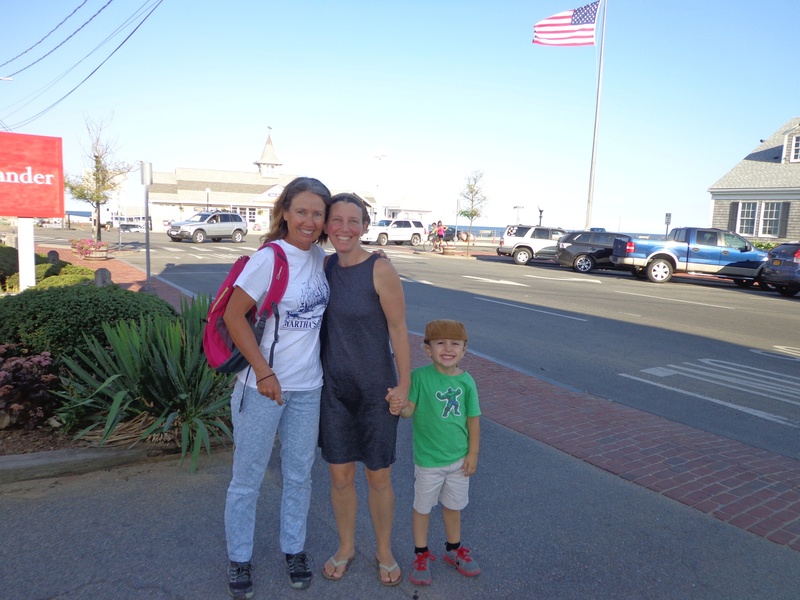 Very little happens in Quonset and definitely no camping so,ahead of schedule, we jumped on the late afternoon ferry to Martha’s Vineyard. This meant arriving at dusk and high tailing to the campground which we reached in darkness. But we’ve pitched our little tent a few times and in minutes we were set up and feasting around a roaring fire. Next day we retraced our steps through this quaint and lovely place in the light of day. Gingerbread houses. This quaint and intricately decorated architecture is perfectly preserved and lived in. It’s like a picture book. And after so many years, such a happy reunion. It feels like we’ve been transported back 100 years…no traffic lights, no fast food, just grand old homes, manicured gardens and ancient oaks. Us with Alex, Tash and Carol. We rode out to Menemsha for their famous dockside seafood. We got lost on the way. With map in hand and surrounded by miles of oak forest, we were incredibly grateful to see another cyclist approaching. He turned out to be a local and groaned when he saw our map. ‘Thats hopeless, missing roads and just designed for a tourist memento.’ he said before pointing us in the right direction. It was further, hillier and windier than we expected, but well worth the effort. It was also where we discovered that of six small towns on Martha’s Vineyard, four are dry! 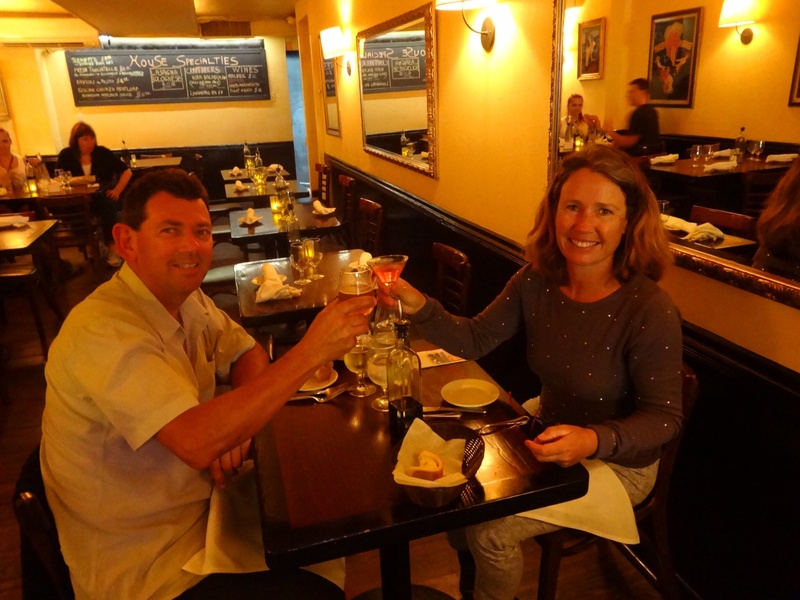 Clam chowder, lobster bisque, stuffed scallops and lobster roll – washed down with water. From Martha’s Vineyard we took the ferry to Woods Hole where a great cycle path wound through bush and past marshland out into the middle of nowhere. By the time we realised our destination was miles behind us, it was too late to go back and not exciting going forwards either. We spent the next day in limbo and right about now realised our plans were so loose we’d ended up in no-mans land. Officially entering no-mans land on this manic bridge. So we ducked into Hertz, hired a little Jeep, loaded it to the gunwales and happily set off again. From Massachussets we drove up the coast to Maine and across New Hampshire, where the official state motto is ‘live free or die.’ Whaaaat! 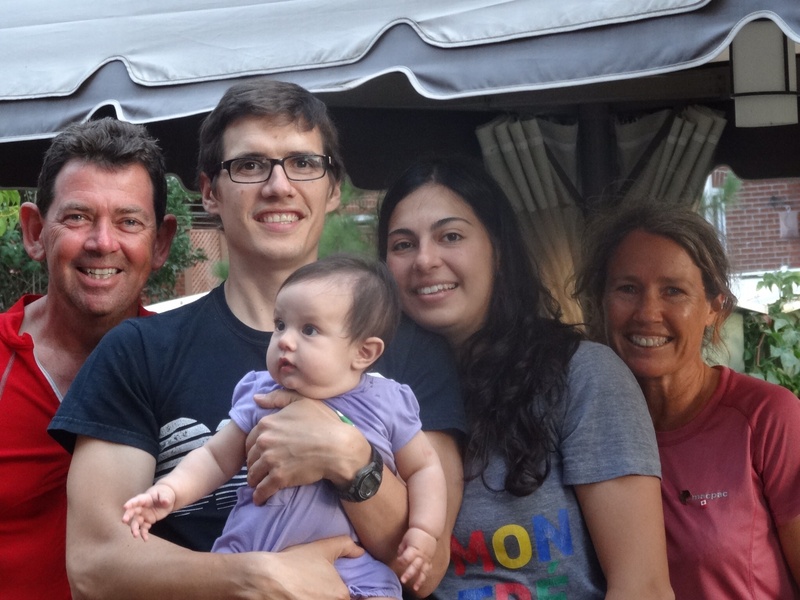 By now we had a plan and were ready to hand the car back in Burlington, Vermont. An unexpected and special detour to the Rachel Carson wildlife refuge. Nice detours easily made in a car. So many covered bridges…a trailer load of straw high and wide. Lake Champlain and the ride north towards Montreal is absolutely picturesque and brimming with old world charm. It’s also fraught with difficulties, starting with the fact that Québécois do NOT like to speak English and very often can’t. This was a big surprise for us since it’s part of Canada and the other provinces make a huge effort with French signage. I have a solution for them though…they should just secede and get on with being French! Back on the bikes and on our way north from Burlington. Just south of Montreal we arrived in a largely deserted campground (most of them are now) and as we Frenglished our way through the check-in process, two more cycle tourers arrived. Lutz and Herbert were visiting from Germany and while setting up our tents, Lutz told us the nearest campground they could find for the next day was 30km out of Montreal. 30km at both ends of the day doesn’t work well if you want to take a look at the place. I sent off some requests on ‘warm showers’ in the vague hope that someone would say ‘yes, no trouble, you can come and stay tomorrow!’ Warm showers is like couch surfing for cyclists. The four of us decided to have dinner at the campground restaurant, but as we entered, the the chef came out gesticulating wildly that they closed at 8pm. I pointed at my watch…7.50pm. “Fritz,’ he scowled. ‘No fritz,’ I said. The owner appeared and after a multilingual exchange it was decided that we could all have spaghetti with meat sauce. Honestly, chefs! A great evening followed, and then we returned to find a surprise email… yes, we could stay with a couple in Montreal! We farewelled Herbert and Lutz next morning, wishing that we had more time with these fun and interesting guys. With Lutz and Herbert near Montreal. Google maps directed us toward Montreal and when hunger pangs grew too much we stopped at a most unpromising looking boulangerie. But a surprising treat was in store. The husband and wife team produced fantastic and irresistable delicacies. And who would have thought a huge chunk of crusty bread with fresh butter and homemade jam could be so downright scrumptious? We ate what we could plus some, before continuing on to Montreal. Rob and Claudia welcomed us like old friends and it was great to be in a home again, a proper shower, a kitchen, room to move and possibly best of all, a real bed to sleep in. These guys have done interesting cycle adventures all over the place and the arrival of little Frida has brought it to an end only for a short while. Armed with local knowledge, we set out for a day visiting markets and other landmarks in Montreal. 30km ought to have covered it but it’s easy to get horribly lost and we did this exceptional well. Still we saw plenty, made it to the markets, got rain soaked and found our way home, finally. 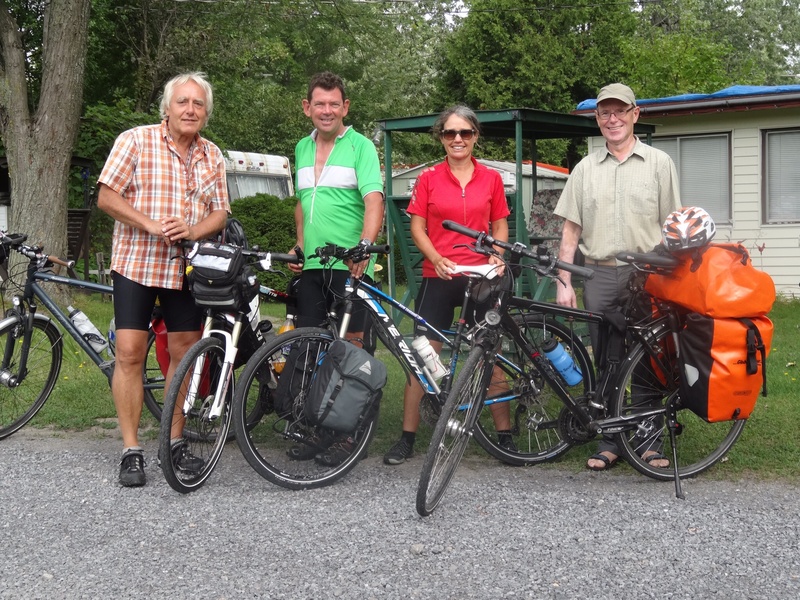 Next day was cloudless and after fare welling Rob, Claudia and Frida we rode through the quiet Sunday streets of Montreal, by now all very familiar, and started out for Quebec City. More entertaining stories. We’re enjoying the journey so much – and all without any exertion ! Vicarious travel has its place when you’re 74. Thanks heaps m’dears. Loved the yellow umbrella, I can’t imagine e a kiwi farmer doing that. The ‘manic’ bridge is a mystery. How does it work? Oh the bridge, well it’s like this, earlier we’d stopped at a bike shop to discuss our cycle route. A couple of geezers (one older, one youngish) were in there. They’re probably sick of seeing people like us. Anyway the bridge came up and one said to the other knowingly, ‘ ol, George, they’re takin th bridge’. The talked to us about it but there was clearly an ambiguous conversation going on and they weren’t about to let on too much. So we got to the bridge and everything fell into place…we were stuck on the wrong side to cross and the traffic was relentless from both ways. We just stood there trying to figure out what we should do to get to the other side. After some time, all of a sudden the traffic started to bank up. One guy in a huge truck decided to stop for us and held up all the traffic to let us cross. This was a huge long line of traffic, two lanes each way! Anyway we raced across and waved our thanks as we clambered onto the tight little walk/cycle way. And continued on over the bridge that was now completely loaded with traffic thanks to us. We avoided eye contact with all the drivers and kept our heads down for the first while. The picture opens up a whole big memory for us! Hi guys, what a trip! We are not getting ourselves into any situations that cause too many problems. Got lost often whilst cycling in Umbria, but only needed to backtrack a few kms each time. Only rained on us once in Italy in 4 weeks. Currently in cinque terra, nice place but the tourists send you batty. Don’t know how we put up with them in Dunsborough. Look forward to sharing stories in a couple of weeks. Hi from Venice, we leave italy in Wednesday, home Thursday night. What are the chances of seeing you two on your bikes anytime soon? Jules & Greg. Thanks for all the stories. Soak up the “fall” as when you get back you will see a wonderful spring – flowers are fantastic and the bees are harvesting jarrah blossom. Look forward to catching up.